Your Shopping Cart in the sidebar will updated when an Add To Cart button is pressed. To remove an item from the cart press the adjacent “Trash Receptacle” icon. When you have completed payment at PayPal please click on the Return to Free Flight Quarterly on the PayPal web site and you will be returned to a Thank You page. You may then select the Shop and check to be sure that your Shopping Cart has been emptied . Purchases may be made directly via PayPal on the Subscriptions, Previous Issues or Books sections lower on this page. Chris Stoddart for payments denominated in United States currency. 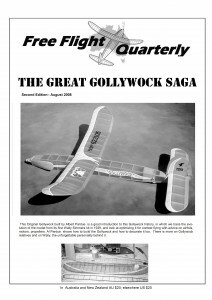 Free Flight Quarterly is produced four times a year on a not for profit basis. Subscriptions are for one year (four issues) and are available for a conventional printed edition sent via airmail, a digital format edition available via download or for both. Click on the PayPal button below for subscription or renewal to the Digital Edition. Links for downloading are provided by email after the subscription process is completed and upon publication of each new issue. Annual collections of previous issues are available on CD in Adobe Acrobat (PDF) format. The price is US$15 per CD postpaid. Click on the PayPal button below to purchase CD 1, issues 1 to 4. Click on the PayPal button below to purchase CD 2, issues 5 to 8. Click on the PayPal button below to purchase CD 3, issues 9 to 12. Click on the PayPal button below to purchase CD 4, issues 13 to 16. Click on the PayPal button below to purchase CD 5, issues 17 to 20. Click on the PayPal button below to purchase CD 6, issues 21 to 24. Click on the PayPal button below to purchase CD 7, issues 25 to 28. Click on the PayPal button below to purchase CD 8, issues 29 to 32. Click on the PayPal button below to purchase CD 9, issues 33 to 36. Click on the PayPal button below to purchase CD 10, issues 37 to 40. Click on the PayPal button below to purchase CD 11, issues 41 to 44. Click on the PayPal button below to purchase CD 12, issues 45 to 48. Click on the PayPal button below to purchase CD 13, issues 49 to 52. Click on the PayPal button below to purchase CD 14, issues 53 to 56. Click on the PayPal button below to purchase CD 15, issues 57 to 60. Click on the PayPal button below to purchase CD 16, issues 61 to 64. 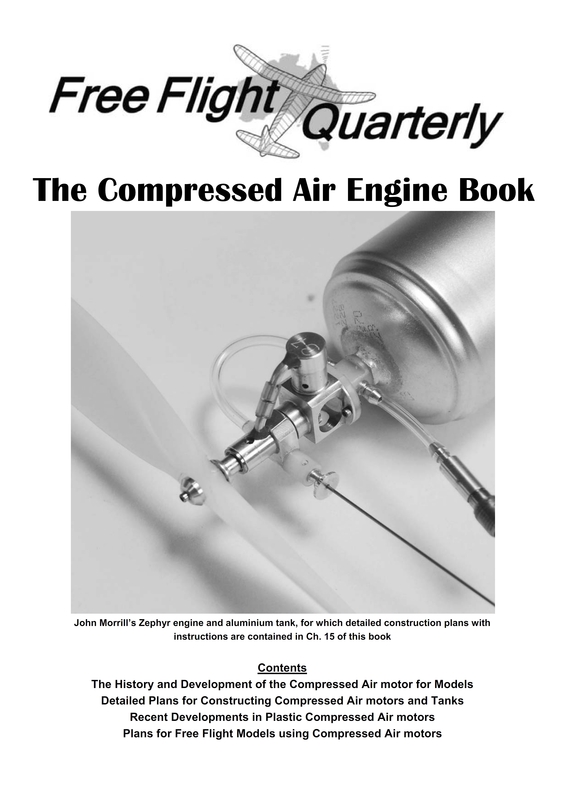 The Compressed Air Engine book – Over the passing years compressed air motors have been at times the most popular of power sources and at other times seen as relics of an ancient era. In truth there seems never to have been a time when some inventive individuals or firms have not been busy in developing and improving these motors or offering them for sale. The Compressed Air book draws on published and original information to illustrate the technology used in the design and methods of manufacturing in several nations. We include examples from France, England and the United States from the early 1900s up to the present. Compressed air motors have attracted modelers in that many of the designs may be readily built by a person with basic skills having access to typically available materials and tools. 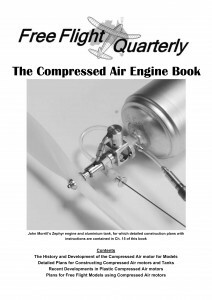 Several chapters in this book address building a compressed air motor. The motors range from a simple single cylinder motor built from brass tubing and rod to a high performance motor requiring moderate machinist skills and specialized tooling. Detailed plans and instructions for these designs are included in each case. Another set of chapters cover the history and application of the motors molded from plastic. Beginning in the 1980s these motors have been mass produced for use in toys and model airplane kits. They have been pressed into service by model builders and flown with impressive performance. In the US Ron Boot’s and the Society of Antique Modeler’s has been promoting flying compressed air motor powered, free flight models in competition. Often seen in these competitions are models powered by the high performance motor designed by John Morrill. One such model is the Sciroco model design by Jim Spenger. Plans and instructions for both included in this book. Purchase The Compressed Air book – the price is US$33. Click on the PayPal button below to purchase. 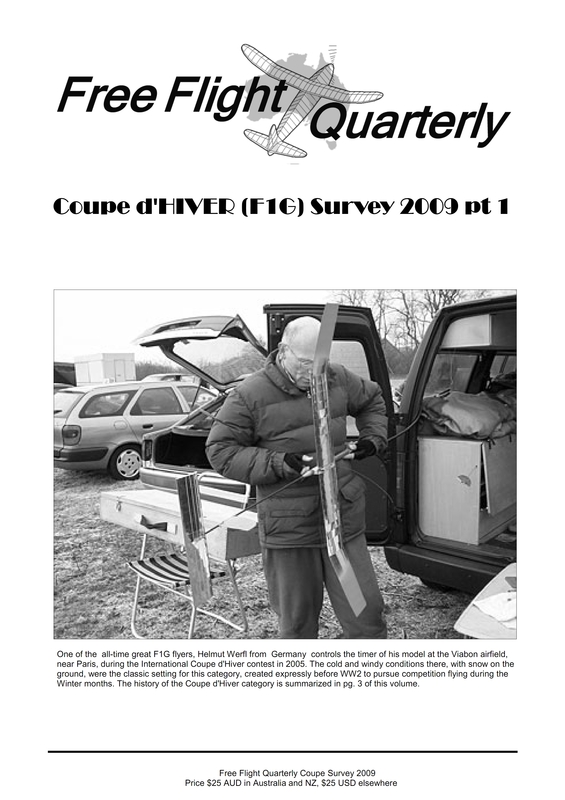 Free Flight Quarterly P30 Survey 2010 is based on the articles which appeared originally in two issues of Free Flight Quarterly in 2005. It has been considerably enlarged with many articles published at a later date in FFQ as well as in other publications (by permission). The book includes a history of the beginnings of the P30 category, trends from the late 1970?s to present day with models from around the world, full size plans for Marie II by John Kamla, and Pepito by Jean Francis Frugoli of France, and articles on topics such as airfoil selection, propellers and choice of motors for a given propeller selection. 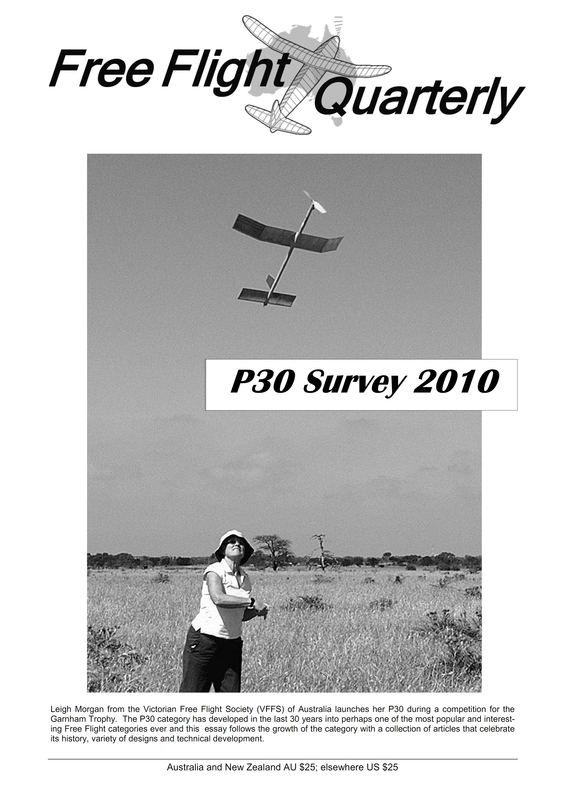 Purchase the P30 Survey 2010 – the price is US$33. Jean Wantzenriether “Insights on the Dynamics of Rubber Powered Models” – In the last seven or eight years Jean Wantzenriether has contributed a large number of articles to Free Flight Quarterly on a variety of subjects, on model stability, on his trimming methods PGI and TOP, on the role and characteristics of the stab for gliders and rubber ships, and on the analysis of propellers for rubber powered models. 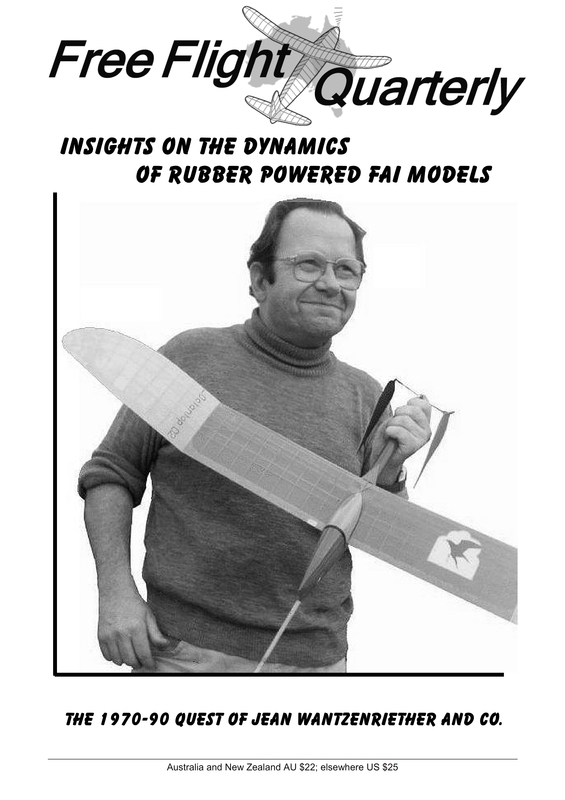 These articles in FFQ as well as a couple of others published in Germany and France have been collected in a single volume: ” Insights on the Dynamics of Rubber Powered FAI Models”. The presentation is more or less in chronological order and allows the reader to follow the development of his ideas. Jean’s contention is that it is possible to have an efficient and stable rubber model without the need for “mechanics “, that is VIT, wing wigglers, etc. if we understand better the interplay between the wing and stab characteristics. Thus his detailed study of the effect of stab aspect ratio on the climb and glide of rubber models and on the stability of gliders. Even for those that incorporate mechanical variation of incidence in the wing and stab, these ideas are of great interest. Purchase “Insights on the Dynamics of Rubber Powered FAI Models” – the price is US$33. 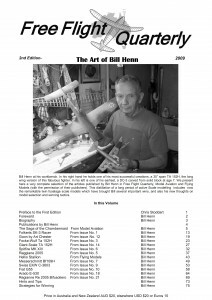 The Art of Bill Henn – “Five years ago Free Flight Quarterly brought out a book of 40 pages , “The Art of Bill Henn”, a compilation of the articles on scale models that had appeared in the magazine. Several printings of this first edition were made, but now it was time for a new one, which incorporated the several articles that Bill has written after 2004. 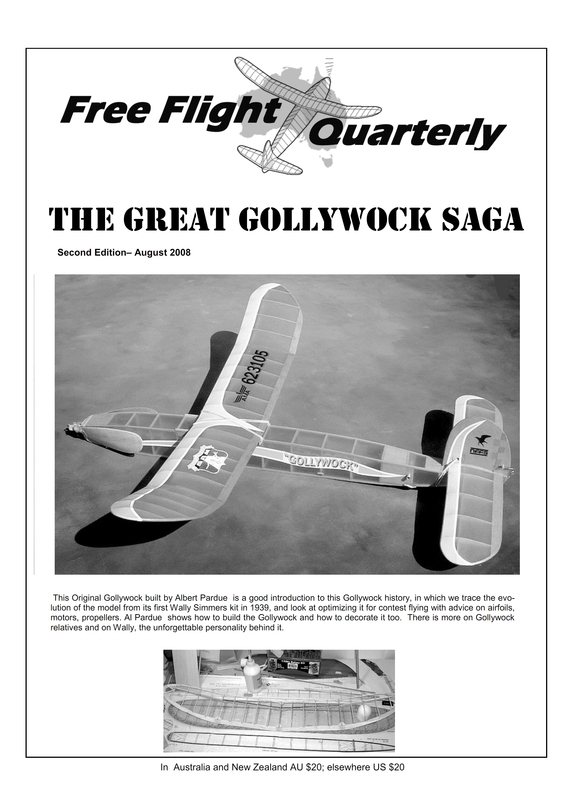 This time the new edition includes not only the later articles that have appeared in FFQ but also those written for “Flying Models” and “Model Aviation”, with the permission of their editors. With these new chapters the book has nearly duplicated its pages to 76. Purchase The Art of Bill Henn – the price is US$33. Coupe d’HIVER (F1G) Survey 2009 – In 2006 Free Flight Quarterly brought out a fairly comprehensive survey of Coupe d’Hiver (F1G) designs, plans and articles related to that topic, from Vintage Coupes to the most modern designs. This first edition found favour with Free Flight modellers and after several printings, the stocks are now exhausted. A second edition has been produced, which has a slightly greater number of pages, but most importantly reverts in size to the customary A4 size of the Free Flight Quarterly magazine, to ensure greater clarity of plans and graphics material. One of the new additions is the “Couper S ” design by Andrew Longhurst, a model that is doing very well in UK contests and that can be built with home resources, without any need for bought-out parts. This new edition of the Coupe Survey contains a full size plan of the “Couper S”. The new Survey consists of two booklets of 56 pages each and the full size plan in four sheets. Purchase Coupe d’ Hiver Survey – the price is US$33. The Great Gollywock Saga – A book devoted exclusively to the history, development and construction of this amazing model and its close brothers: the Jabberwock and the Dynamoe. The 60 pages in two-column format familiar to readers of Free Flight Quarterly contain eleven chapters that include: Origins, Versions, Trimming and Flying, Motors and Propellers, Timer installation, Airfoils, and Rival Designs. Many people contributed generously of their time and expertise in the writing of this book. Among them Gene Wallock describes his system of hinge construction for perfect folding, Al Pardue has written and illustrated a chapter on building, finishing and decorating a Gollywock, while David Mills examines a possible sibling to the Gollywock: the Ray Smith Mulvihill, adding his recollection of an evening with Wally Simmers, and discoursing on the Simmers Dynamoe, and its excellent performance in the Moffett Trophy. The book also includes a new full size plan for the Gollywock II version in three A3 sheets. Purchase The Great Gollywock Saga – the price is US$33.